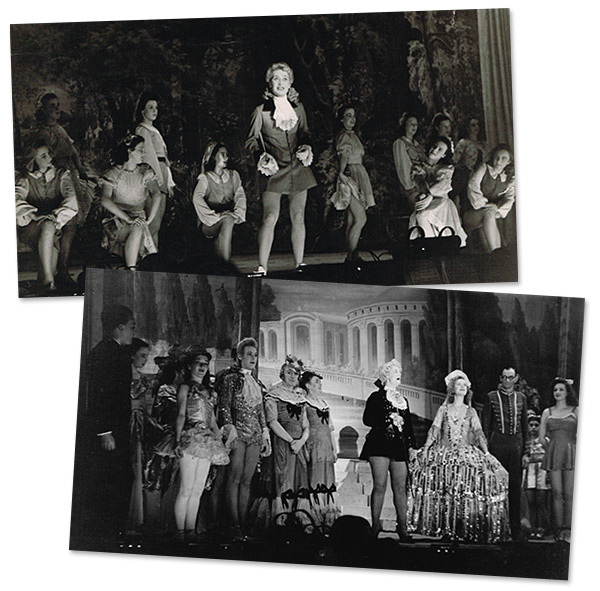 I was a member of Gertrude Yearsdon’s Corps de Ballet. We used to be engaged for many local shows. 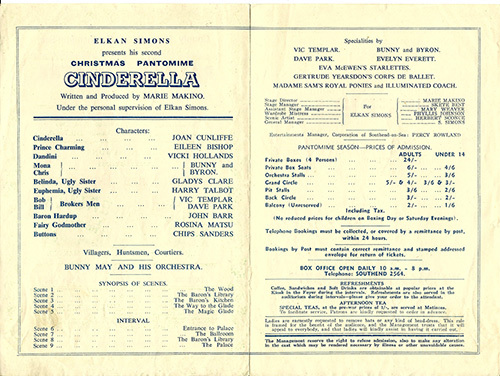 One of these was at the Palace theatre where, for the 1946-47 Christmas season, we performed in Cinderella. 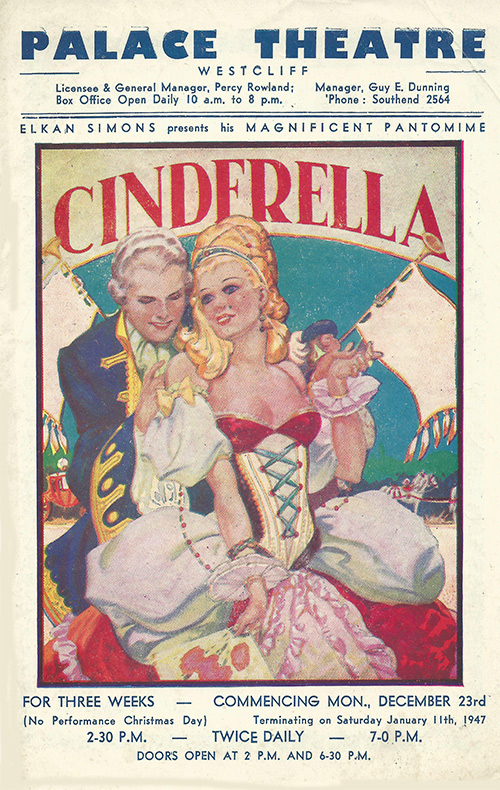 Here are two photographs from Cinderella. In the top one, I’m kneeling to the left of the actress in the centre while, in the lower one, I’m second left. This was a very demanding show, but very enjoyable. I well remember the ponies (“Madame Sam’s Royal Ponies”) that pulled the coach: whether they were drugged in some way I don’t know, but they were very docile! I really don’t know where they were being stabled, as they had left by the time I came off stage each evening. I also remember a lovely performer called Dave Park who, with Vic Templar, played the Brokers Men. One day, during one of the first rehearsals, someone pointed out a sack lying on the stage: to my horror (and their delight!) I jumped when a hand suddenly emerged! Dave was curled up extremely tightly: his part called for him to be carried on stage in the sack, then he would slowly crawl out of it, do a dance and exit! But my most abiding memory is that policeman! After the show I had to rush out to catch the last bus home. One evening I didn’t bother removing my stage make-up. So there I was, 16 years old, standing on the pavement, late at night, heavily made up! This was when the policeman approached me and asked me what I was up to! I explained I was from the theatre, but he didn’t believe me. Eventually, he took me to the theatre, where my fellow performers identified me. The matter ended nicely when the kind policeman escorted me to the bus stop and made sure I caught my bus – but I was never allowed to live this down! And from then one I always removed my stage make-up before leaving the theatre!! I wanted to become a professional ballerina. I took the Royal Academy examinations, and did some teaching for local groups. But then I got married, had a family, and that ended my career as a dancer. Even so, those days have left me with some wonderful memories! 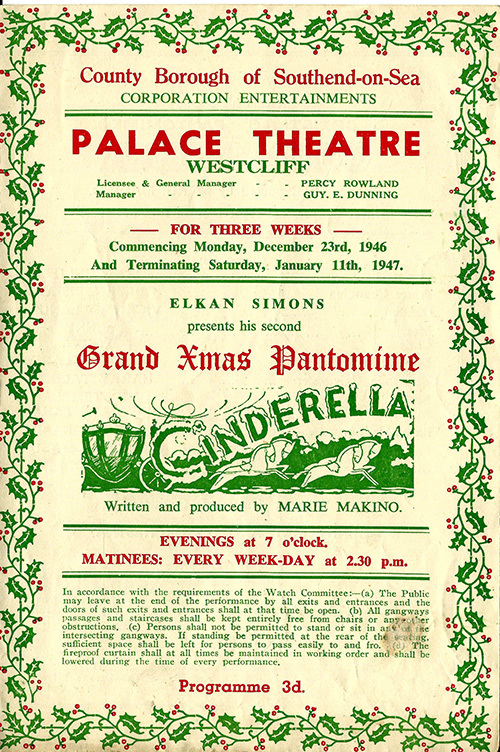 Archivist David Simpson adds: I first had the pleasure of meeting Jean, and her friend Linda Parish, at the Palace Theatre Open Day in December 2014. We then had another nice chat at a Theatre Club social morning, when Jean brought along these photographs and kindly allowed me to add her story here. The moral of this tale is clearly that stage make-up should be removed before leaving the theatre!! This page was added by Ian Grant on 09/03/2015.